Smells from electric baseboard heaters are usually the result of accumulated dust that is being heated. This unpleasant odor usually appears immediately after the heat comes on, particularly after an electric baseboard heater has not been used for a season. The smell may be barely noticeable or overpowering, depending on the amount of dust in the unit and the contents of the dust. The smell of burned hair, for example, usually indicates that pet hair or human hair is trapped in the heater along with the dust. 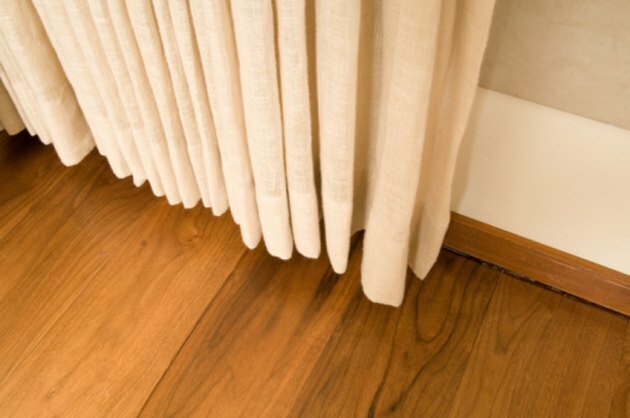 Baseboards often accumulate dust, which can spell trouble for baseboard heat. Turn off the heat immediately after you notice the smell. Allow the electric baseboard heater to cool off. Take the cover off of the baseboard heater. Typically, there will be one to two small screws on each end of the heater that hold the cover in place. Remove these screws using a screwdriver and gently lift off the cover. If the cover simply snaps on, gently remove it and place it aside. Once the cover is off of the electric baseboard heater, the heating element will be exposed and you should be able to see how much dust has accumulated on it. Clean the heating element with a vacuum or damp cloth. Remove dust located under the heating element or in any other hard-to-reach areas with a damp toothbrush. Clean off the underside of the cover with a damp cloth before reassembling the heater. Replace the cover and reattach any screws.